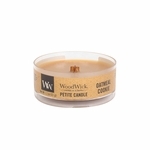 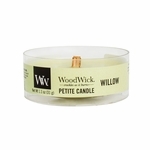 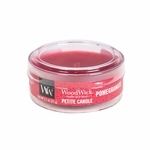 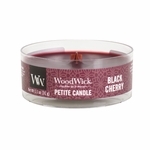 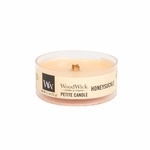 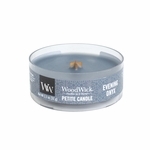 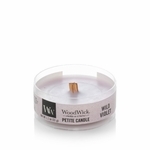 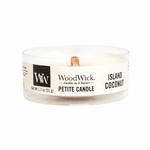 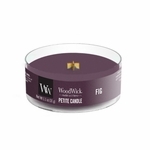 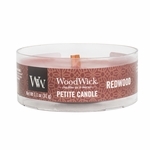 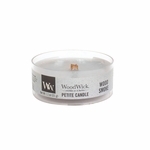 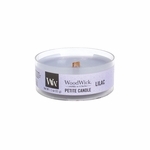 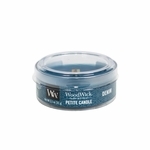 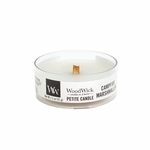 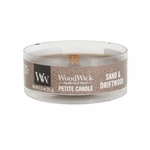 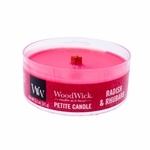 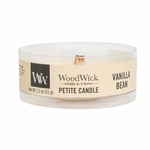 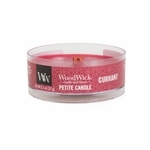 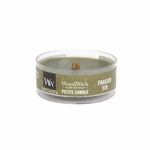 The new value priced Petite candle is a great way to experience WoodWick� fragrances. 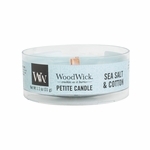 They're perfect for candlescaping by creating a calming, beautiful ambiance for any gathering. 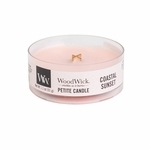 Bright violet bouquets intermingle with sparkling sea spray and warm vanilla woods. 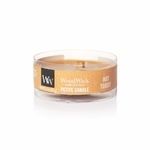 Heady blends of poppy and teak mingle with notes of citrus spice and amber woods. 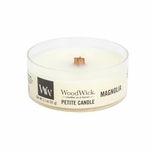 Dewy tuberose blossoms intertwined with fresh fig leaves and crisp eucalyptus. 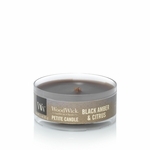 Black amber with rustic notes of tobacco, musk, and mandarin. 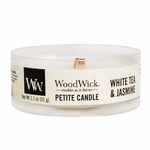 Delicate jasmine petals laced with warm cedar and smoky incense. 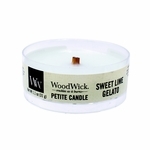 Zesty lemon and lime combination blended harmoniously with spun sugar, vanilla bean and sweet cream. 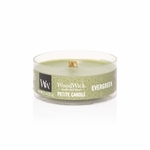 An aromatic infusion of sparkling lime, parsley, and wild lavender with hints of peppercorn and fruity musks. 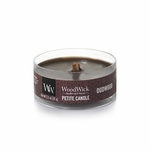 Rich indigo denim blended with musk, vintage leather, and rustic woods. 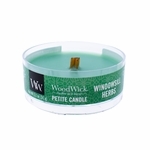 Fresh balsam branches embraced by fresh-cut herbs and a hint of patchouli. 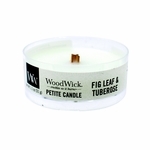 Ripe fig melds with nuances of rich cassis, elderberry, and earthy patchouli. 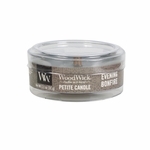 Tempting notes of ground cinnamon and nutmeg swirled with caramel drizzled apples, and sweet maple wine. 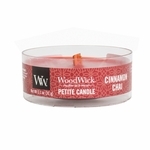 Sugared ginger and rich, cream icing blend with molasses, nutmeg, and clove over a warm base of allspice and vanilla. 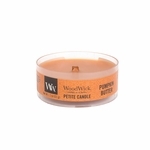 Toasted pecan crumble tops a ginger pumpkin puree, swirled with vanilla and cinnamon. 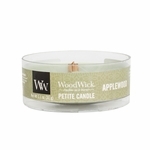 Crisp orchard notes of apple, pear, and peach intermingle with floral nuances of lilacs and jasmine. 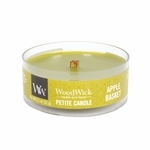 A delicious combination of fresh apple slices baked with caramel and topped with a buttery crumb crust. 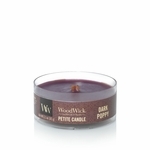 This deep palette of jasmine leaf, black orchid, and sandalwood is a mysterious treat for the senses. Fresh green stems and a bed of fir needles, with hints of white lilies and amber. Cascading branches of soft orange and yellow honeysuckle with gentle accents of jasmine. 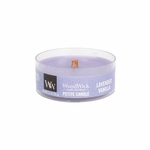 The timeless scent of lavender is softened by a powdery vanilla swirl. 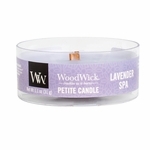 Colorful bursts of garden lilac fill the afternoon air with their familiar, lively aroma. 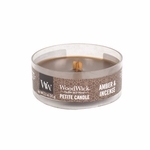 Warm spices of cinnamon and allspice complement wild oats and creamy almond milk. 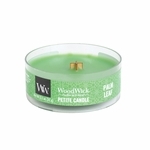 Lush greens and a medley of tropical fruits, with undertones of vanilla and coconut. 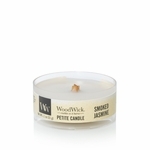 Relaxing and clean, this fragrance envelopes the senses with soft fabric and a subtle kiss of jasmine and rose. 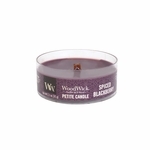 A delightfully rich blackberry and cinnamon filling inside a flaky, vanilla-drizzled danish. 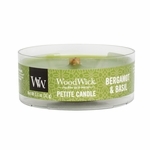 Garden herbs of basil and tea leaves give a sophisticated twist to the classic scent of bergamot. 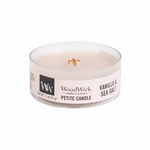 Soft vanilla blossoms swirled wtih notes of sea salt and jasmine.